Growing enrollment isn’t only about recruiting new students. It’s about retaining those we have. Enrollment growth on the recruitment side of the equation will take time as we revitalize SIU, so it’s critically important that we also immediately focus on retention. A number of factors contribute to student persistence: the quality of our academic programs, mentoring by faculty members, strong advising, and the quality of campus life. We can ensure every student has the support needed – through strong academic advising and faculty mentoring – to ensure that they will stay in school and graduate. Several years ago, the university developed a retention plan that appeared to have some success in its first year. Unfortunately, the plan began to gather dust and we have lost our way. I have asked the provost’s office to work with deans and others to revisit the plan, identifying what worked, what didn’t, what we might revive and what we want to add. I hope the campus community will engage in the effort. Longer-term retention will also be positively affected by our revitalized academic programs, a revised core curriculum, and our attention to student life and the total SIU experience. The retention cycle is indeed magic. If we focus on quality education and support, our students have greater success, which drives greater retention, allowing us to have larger classes of juniors and seniors, generating more resources that we can reinvest in our programs. Currently, 27 percent of the freshmen who enroll at SIU graduate in four years, while 44 percent graduate in six years. 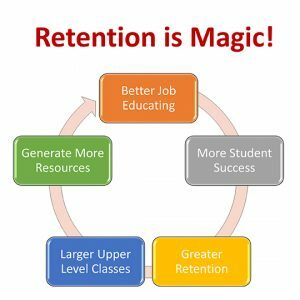 If we dedicate ourselves to the magic of retention, we can change these rates to 55 percent for all students in four years and 65 percent in six years by 2025. I believe we can do it with the commitment of every faculty and staff member. Please join me in making that commitment.